The weather remains very unsettled with pulses of mild followed by cool depending upon whether the next system is yet to arrive or has passed. If your in the UK/Ireland, expect rains to push eastwards into the North Sea tonight with increasing temps and breezes as the next Atlantic front pushes from Ireland. Milder with periods of rain tomorrow but by New Years Day temps dip again bringing increased hill snow which may manage to drop to low levels later in the day Sunday. Scandinavia, like the UK is seeing periods of mild followed by cool with stormy periods in between but the big difference is that each push of cold drawn down on the backside of each passing low appears to be colder than the last and thus snowfalls are building the snowpack which up until recently was very poor. 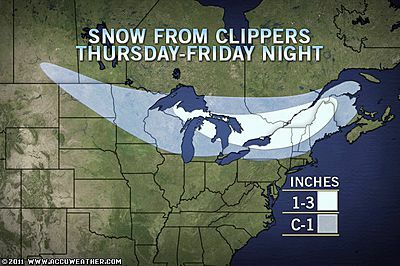 Each system always throws a cold front down across the Alps, likewise bringing more snow to the ski resorts. It seems the changes are beginning to show, a chipping away of the warmth we have all seen this autumn and early winter. 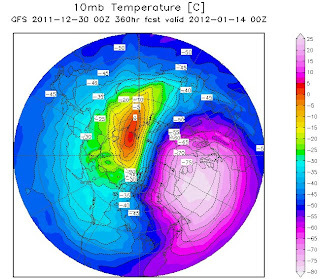 Is Stratospheric Warming from Asia to Alaska the first signs of largescale hemispheric change? For the first time this winter, it appears truely Arctic air (not modified by the ocean) will work it’s way into the mid-latitudes of North America and eastern Asia. Yes, we do remain in the positive indexes of both the NAO (North Atlantic Oscillation) and AO (Arctic Oscillation) with a progressive, generally zonal, stormy (wavy) pattern around the N. Hemisphere with ‘shots of cold’ seperated by mild, maritime air. Up until now, we have seen relatively weak cold, highly moderated by the oceans and with a strongly positive Arctic Oscillation, this has held all the true Arctic air north of the circle. However, recent weeks have showed warming of the stratosphere and this continues to do so at 10mb. It appears this warming is bleeding around the pole from Asia towards Alaska, displacing the coldest upper level air across to Europe but STOP, that doesn’t mean we see a deep freeze, no! But it may suggest the Arctic Oscillation may be heading towards neutral and if this progress continues the way it is, then it could well turn negative. 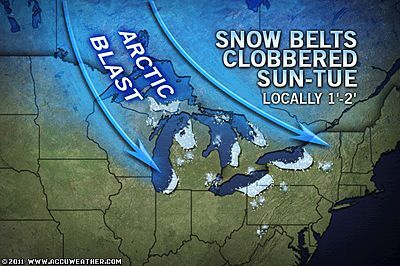 Negative meaning, the polar vortex is weak and split, allowing ridges pushing north to reach and pull down pieces of this Arctic air. 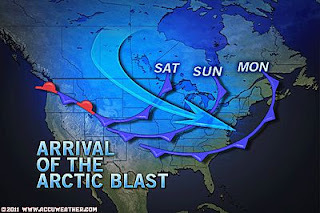 This will be visible NEXT WEEK as we see the first true (albeit relatively short lived) Arctic outbreak plunge into the Central and Eastern US from Sunday through Thursday. During this same period, a push of Arctic air will also push south from Siberia into China where here too, the coldest air will arrive. These lobes or fingers of true Arctic air are being allowed to branch off from the vortex, likely due to this warming of the upper levels. This gradual cooling of the troposphere beneath the stratosphere, allows the cold down to the surface and interestingly, where that warming is taking place, so the Arctic air is going to. Yes, that means that with displacement of the coldest air aloft heading across to our part of the world, this suggests we WON’T see anything too terrible just yet with likely some brief shots of still-modified cold quickly followed by milder air, afterall, we don’t yet have a negative NAO to show for the high building north from the N. Atlantic up over Greenland and therefore air will continue to free flow across us from the west. 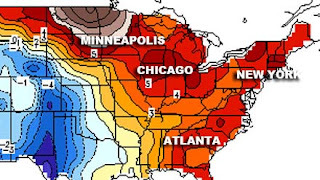 It’s the same for eastern North America that despite a bitter chill next week, this will be quickly followed by milder air again by weeksend simply because there’s no stone (blocking highs) to stop the progressive west-east flow across the hemisphere. The good news is, that whilst the evidence is there of change, this progress takes time and it’s likely that if it continues, we will see more and more Arctic air reach the mid-latitudes and the return to a negative AO which may lead to the development of a negative NAO and the ultimate blocking pattern needed for a locked down period of cold. This will allow us to turn a LOT colder and remain that way for perhaps a few weeks. I believe that given the current pattern and where we’re at just now, I recon by Jan 15th through 20th and leading us into the late January period, we may well see a very different weather pattern over us which may present a challenging February and possibly March ahead. The big concern is, IF we see this THEORY become a reality, then with such a long period of building cold thanks to the strong and persistent positive AO, then once that cold arrives, it may be much stronger than what we endured both last year and in 09-10. As well as that, could the NAO, again IF it does flip, last as long in a negative state as it did in a positive? If so, we may still see, one of the worst winters any of us have ever seen, deeming the last two mere curtain raisers. This is all very speculative and likely could be put down as hype, however, I like to share my thoughts with you and POTENTIALS with this pattern. Arctic Shot Of Cold Air To Plunge Southward From Canada Shortly! 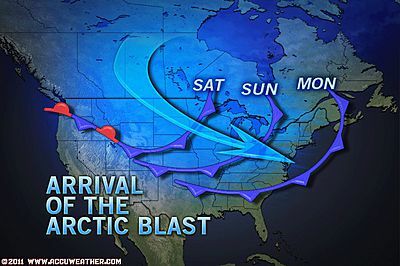 Next week’s cold of Arctic origin will be dramatic contrast to December! Very Strong, Fast Moving & Potentially Damaging Winds Developing In The Rockies & Northern Plains.